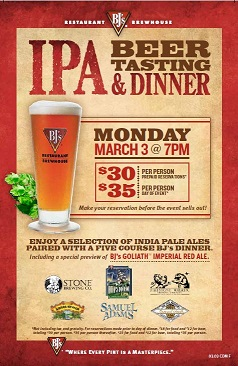 BJ’s Restaurant and Brewhouse locations are hosting an India pale ale pairing dinner in March. The five-course dinner will be paired with IPAs from Firestone Walker Brewing Company, Samuel Adams, Samuel Smith Brewery, Sierra Nevada Brewing Company, Stone Brewing Co., and of course, BJ’s Restaurant and Brewhouse. During the course of the dinner, BJ’s will be serving its next seasonal beer BJ’s Goliath Imperial Red Ale. In Southern California, the dinners are scheduled between Monday (March 3) and Wednesday, March 12. The dinners cost $30 and will be $35 the day of the event, if available. For a preview, click here. For reservations, click here or call your local BJ’s Restaurant. This entry was posted in Beer dinners, Restaurants and gastropubs by John Plessel. Bookmark the permalink.